Declutter the easy stuff first. I can’t stress this point enough. When I say easy stuff I mean the stuff you find the easiest to part with. The things you care the least about. The things that are easy to offload. The things that you can get at easily. The things you know you have too many of. The things that are rusting in the back garden. The broken, never to be repaired things. The outgrown things. …the things that hold lots of sentimental value. …the things that you think you might like to post on ebay but don’t think you can get your mind around that just yet. …the things that you feel guilty about letting go because someone else gave them to you or they have been in the family for generations. …the things that belong to someone else in the household who isn’t ready to let go. …the things that that are full of other things that you have to get rid of first. Like furniture that you know you don’t want but is still full of grandma’s old china. There are three reasons why I say this. Because there is no hesitation to get rid of these things you care little or nothing about therefore you will make quick painless progress. Quick progress at getting things out the door. With this method you may find that you aren’t seeing much change for your efforts at first because you are plucking things from all over the house but in order to start reshuffling and making order of the choas one first needs to create some breathing room. Many people take a long time to get to the point of realising that they are getting overwhelmed by their stuff. At this point they are already feeling stressed. So what they don’t need is to then get overwhelmed by making difficult choices. They will soon decide that they were less stressed with the stuff than they are getting rid of it so they give up. They feel they only have two choice, stress or worse stress. Better to settle for just stressed right. No, better to work at it slowly chipping away at the easy stuff and feeling like you are making progress. It is important of course that one allows themselves to be satisfied with this progress and not expect the problem that took years to accumulate to go away over night. My experience tells me that there is always easy stuff. The more you flex your declutter muscle the easier the job becomes. What at first you thought were things you would never get rid of eventually become the next easy thing to send out the door. So why stress over detaching yourself from these items now when it will be much easier later on. Focusing our decluttering efforts on one specific space may sound orderly but it can force us to have to make decisions on things we aren’t ready to let go of yet. Way back in my declutter mission I had a goal to make space in your living room by getting rid of a big china cabinet that dominated the space. Luckily for me there was a lot of things in there I was happy to get rid of. But in order to be able to make the remainder fit elsewhere in the house I needed to make space. By decluttering a few thing in the bathroom I freed up space in the laundry. By freeing up space in the laundry I freed up space in the kitchen. I also decluttered lots of stuff from the kitchen and also books from the bookcase. With all that done, without stress because it was all stuff I was happy to part with, I not only managed to empty the china cabinet but I also had room to spare in the kitchen. You might think that patience was the key with my china cabinet declutter but in fact I was so content to declutter my one thing a day that I rarely experience impatience. It was the same with my craft area declutter. Slowly slowly giving myself permission, without stress, to let things go lead to are marked difference over time. Lately I have been working on a task that I have happily managed to mostly avoid since the beginning of my declutter mission ~ decluttering photographs. I have done a little here and a little there but I have never felt inclined to really get into in because there has always been plenty of other tasks I have been happier to work on. To be honest I think I am almost running out of other things to declutter for now so the photos will get lots of attention. So go easy on yourself. Allow yourself to mature into this declutter process by simply focusing on the easy stuff. I have been at this mission for almost three years now and the biggest effort I have made in that time is blogging about it. Where possible use less of things. You might be surprised how regularly you use more of some things than you need. Here are some products you could probably stand to use less of ~ less shampoo, less conditioner, less laundry detergent, less dishwashing liquid, less toothpaste, hand cleanser, car wash… Quite often advertisements and manufacturers instructions suggest more than what we really need use. So using even more than that is a fools game, wasting product, your hard earned cash and increasing supply due to demand. This has been the most important lesson for me: always take it easy. Thank you for the reminder, I think you can’t stress this often enough for me. Hence the reminder. I wouldn’t want anyone to be doing it the hard way. There really is some value to this suggestion to declutter the easy stuff first. You can feel really good about making a difference and seeing your home look much nicer and cleaner and you don’t have to make the hard decisions right away. Listen to Colleen! She’s right! Thanks Spendwisemom. I really think the whole job can be relatively easy from start to finish. Because as I say, as you progress it gets easier to part things and what once seems important just isn’t later on. This is so good Colleen. I have tried to get this point across to S but for her it is the opposite. Just thinking about doing it one thing at a time drives her nuts so she doesn’t do anything. She is the exception I think. The biggest stresser for me would be to try to do it all RIGHT NOW. Gag! THAT is overwhelming. Photos!! Aren’t those hard?! For a scrapbooker to say that she is doing less scrapbooking and less photo taking is crazy but that’s where I am. I was never one to record every little detail of every day. Now I find myself taking pictures and then deleting many of them out of my files. It’s one of those things where I take them, download them to a file on my laptop and let them sit awhile. A week or so later I will go back and take a look and decide what I want to do with them. It’s amazing what having a week or so does to their importance. I’ve even dismantled some albums and gotten rid of many of what was in them. I think you and I might have a similar approach to scrapbooking. Don’t feel the need to view your entire life through a camera lens. I love that my phone has a decent enough camera that I can take photos of things on the spur of the moment. However that is a quick grab, snap, done. The photos automatically upload to DropBox and then like you a week later I choose the best and ditch the rest. I’m learning it is so much easier like you said. I no longer feel like I HAVE to do it. That means that when I do scrap a layout it is because it really has meaning to me. Hi Colleen! I think you have said these words to me many times, in different ways. I think that what we want, sometimes, is a magic wand, so we could move it over our clutter and it’s gone. I have made progress, but still, I do want things to move faster. But there are piles and piles of stuff, things that still don’t have a home, rooms, wardrobes that still have too much stuff. I am still reluctant of letting somethings go, so I did what you told me before and in this post: I went to the stuff I did not have to think about. However, sometimes, I still think I should get more storage places in my house and keep all I have, because I might need it. In a rational way I do know that is not true. Keeping things just to keep them is not a rational behaviour at all. You are right Andréia. If they were realistically a waste of money and space in the first place then if you don’t have them in the future they would once again be a waste of money to replace. So what does it matter to get rid of them now. All we really need is shelter, clothing, bedding, food and love. I think perhaps you really have to give some thought to the need v want question. I’m with you on wanting the magic wand but I don’t think the wand would really work because, as times goes on, and we slowly and mindfully declutter then things become easier – stuff I hadn’t noticed because I need those fresh eyes that others mention suddenly ‘shouts’ at me to go out the door and the magic wand would miss these. I can’t believe how many things I have revisited that were put in the ‘must keep’ pile 20 years ago and there they have stayed until now, as because most of the initially ‘easy’ stuff has gone I have ‘discovered’ that really, much of it was aspiration all clutter. Like others, I have days when I’m on a roll, days when I forget/ am too busy, and days when someone has stolen the light at the end of the tunnel. Such is life, but the slow decluttering is actually helping me to review my lifestyle and make progress where I thought there was none to be made. Good luck, you are on an exciting journey – travel it at your own pace and in your own time. Fruitcake, you put it really well, I think. The same goes for other areas as well. We have too much but often I can’t chose which of the near-duplicates should go. I really enjoyed this post, it is such good advice. I haven’t commented in ages but I make sure to read your blog every day, it keeps me calm about my decluttering. I am still very much at the stage of dealing with the easy stuff and I have another pile of things to take to Goodwill this afternoon, which will bring my total number of items donated since I started decluttering in June to 606! Definitely the easy top layer, and things that have accumulated over many years. I am already feeling so much better about all of this, and it is a relief to see shelves and cabinets and closets with space in them now, and a steadily growing pile of empty storage containers and organizers which are no longer required. 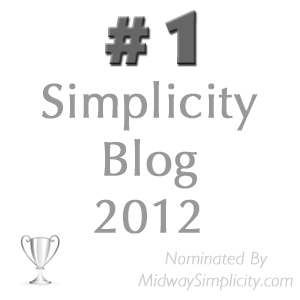 Thank you so much for your helpful and encouraging blog. It is my pleasure to be of service Christine. And thank you for letting me know that what I do here is a help to you. It seems you are making wonderful progress. Good for you. This is such very good advice Colleen – be kind to yourselves folks; you don’t have to take that really painful difficult decision today…go for the easiest option. I go through phases of just the odd thing here and there and then an unplanned phase of a frenzied few hours over several days where quite a lot gets thrown ( by thrown I mean leave the house, not necessary to landfill). Like you Colleen, I have been doing this several years now. It’s like my declutter muscle needed building up with gentle easy stuff first and every so often, voila, I can suddenly run a half marathon…and then I need to rest for a bit. Some days I still need to do the easy stuff, but every so often I can tackle the harder stuff . If I can’t face the difficult stuff today, that’s ok, I know I will beable some other day and I dont need to stress about that today. Over time I have got rid of so much – as you say Colleen, over time you see the difference. I trust myself to know when I can cope with more, normally when I feel an overwhelming urge to up the anti on simplifying my life and this feels stronger than the emotions that keep me tied to the clutter in the first place. Just this weekend I have passed on to a charity shop 2 items I have had for over 20 years and have have always been on my ‘not even up for consideration for decluttering’ list. But as I have grown accustomed to letting go of the easier stuff, I have become psychologically stronger and able to cope with more. I have experienced the relief in simplifying my life and that when I find it painful after letting go of something, I do survive that and the anxiety fades with in day or so of it leaving. I just looked at those two things with fresh eyes this weekend and realised I never used them and bish bash bosh, they were gone, just like that. No agonising, just gone :O). Decluttering in my experience is a process…of building up emotional strength and self understanding of why I am attached to the stuff I own and how I really want to be living in the present. It’s a process of peeling back the onion layers of stuff and just when I think I’ve done enough, I realise there is loads more I am now ready to face. Exactly Katharine. You describe the process so well. Good luck with decluttering photos Colleen. 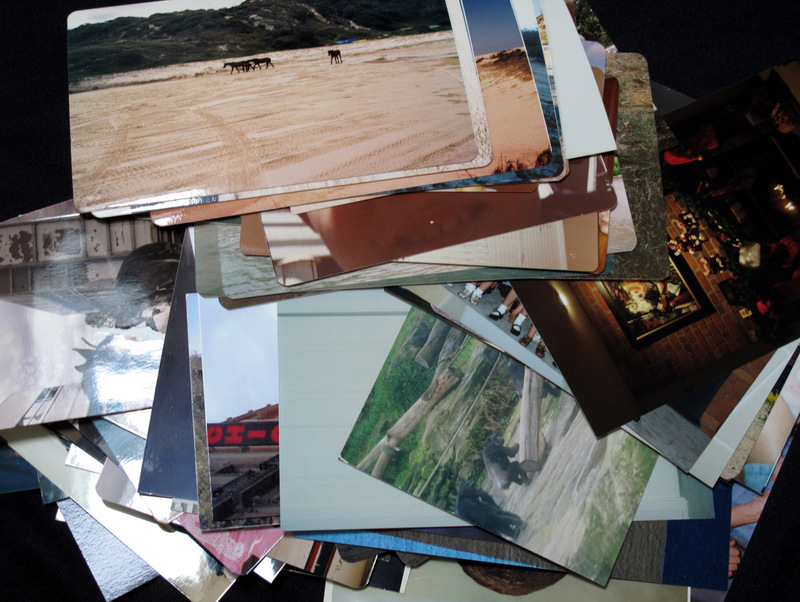 I was always the family historian, and when I decluttered my parents’ house I took all the photos too. It took me several weeks to go through all their AND my photos a couple of years ago and I managed to get them into an archive-sized box. It’s a great feeling:-) I haven’t printed out any of my own photos since, but I’ve been quite organised and ruthless with my digital photos. The kids and I actually enjoy looking at physical copies of photos, even though I don’t bother with albums anymore, so my next project is to print out the very best from the last couple of years. Thank you Loretta. Just like everything else I will get this task done at my own pace. I am feeling quite relaxed about it. My plan is to go thorough a box at a time. Declutter what I feel happy to part with. Get out another box and do the same. Hopefully condense the two boxes down to one and then go through them again. Eventually I will be ready to say that is enough. But I may continue to week over a period of time much the same way I have done with the house. Letting go of more as I become more ruthless. No hurry but. I do have a friend who wants one of my photo boxes so that should give me inspiration to get one cleared out. Love the post today! I especially love reason #3. Once I started my own declutter process, starting with all of the easy stuff first, I eventually experienced the results that come from getting rid of your stuff. For some it may be the look of your home, the reduced time it takes to tidy up, the feelings that come from not having as much stuff to deal with or simply how it makes you feel to give to others. For me, it was a combination of those. However, once I started the declutter process, I started looking at other items, especially the difficult ones, in a different light. My attachment to some of those things has changed, so I am finding it easier to “just let it go”. I love the chain reaction effect that you experienced just by letting go of your china cabinet. I had a similar experience on a smaller scale not too long ago. Hi Jen, that chain reaction is what it is all about in my opinion. A little here leads to a little there, a simple reshuffle, find some more stuff, get more ruthless. Next thing you know there is empty shelf, one less piece of furniture and a whole lot less dusting. Some years ago I read a book on decluttering or even rather on overcoming hoarding and mess (not worth mentioning the title here because it neither is available in English nor a very good book) and it mainly had one message: Don’t let anyone tell you it’s hard. Because it isn’t. The author was quite annoying about this point, repeating it over and over again but there does lie truth in his statement. It think having “decluttering is easy” as a mantra for the mind and “start with the easy stuff and do it in small portions” as an advice for the action really is bringing you forward. Telling yourself how hard (or even impossible) it is or how big a task it is to declutter is self sabotage in my opinion. So is starting with the hard stuff that you already know who won’t be able to make a (quick) decision about anyway. Lucky us, point three really is SO true: The hard stuff (or at least some of it) will become the easy stuff soon enough. Hi Ideealistin, I think I would like to read that book. It was an ah ha moment when the thought occurred to me to declutter in the style that I do. I was like many people, avoiding the task because it sounded too much or a hassle. From the moment that I decided to declutter a thing a day the task became doable and dare I say enjoyable. It has also taught me so many other things that I am so grateful for whatever divine intervention put the idea in my head in the first place. The book is Thomas Ritter, “Endlich aufgeräumt”, and what I thought was interesting about it when it was released in 2004 was, that it talked about the subject of hoarding when almost nobody else did. (Though it does not draw a clear line between hoarders, packrats and disorganized people – but I think that is not solely the authors fault but a general difficulty in drawing the lines here because there is much overlapping plus no clear definitions) The author says he’s an ex-hoarder and claims overcoming his desire to accumulate stuff, his inability to part with things and his generally messy ways by simply deciding to do so. He tells his own story and peeks into the life of friends who also have problems with hoarding. He condemns the approach of a self help group that stresses how difficult it is to overcome your problem and that hoarding is comparable to alcoholism – something you can get under control but still something you’ll be endangered to do for the rest of your life. I found his approach that the most important part is the decision to change and that everything else will fall into place alluring – but if it had been really that easy for me I would have been decluttered years ago. However, I greatly appreciate one thing I learned from the book: Don’t tell yourself all the time you’ve got a problem. Tell yourself you found a solution. Focussing on the problem, thus categorizing yourself as a troubled person, will only overwhelm and paralyze you. It DOES get easier. ‘Nuff said! If folks want to find an excuse to not take a first step in regards to anything then they will find that excuse. Too overwhelming. Too little a challenge. Too close to Christmas. And so on. I’m guilty of it as well, but once I got started, the momentum has yet to let up & now I’m nearly done. For me, when I find myself not sure where to start or overwhelmed with it – I start with what’s to my immediate right. If I’m in a room, I look to the right of the doorway & work in a clockwise fashion in a circle around the room. If I’m at my desk, I look to the right of the computer & start there. If I open a drawer, I look at it like a face of a clock & I start with 12 & work my way around it. If I’m overloaded with tasks that seem too overwhelming…then I take things 1 item at a time or 1 color at a time or 1 style of item at a time or anything that makes it a smaller bite to chew so to speak. I like the way you think Jane. I bet you are a visual person. My daughter was once told she would be marked down in Science class if she didn’t take notes the way she was taught. She told the teacher she would be doing it the way that worked for her or she may a well not do it at all because she would get lost in all the words. She colour codes her notes. The teacher got the message. Colleen, yes you are correct in that I am a visual person. I totally relate to your daughter’s color-coded note system as I do the very same thing! Funny thing despite being a visual person, I don’t like things out & about. I much prefer things to be kept hidden away (albiet organized) with the exception of an active project or task. Then I need it all laid out efore me so I can take it all in & decode what to do with it. That goes for crafts, studying, home projects, etc. As another visual person, I can confirm that having things out of sight is a much better environment for me. It’s like I can’t not see something. For instance, I’m looking for a cabinet for my craft supplies, since while they are on shelves I get hit with “oh, need to finish that, and that, and that, and cull thru my beads, and what was that idea I’d had for that, and I got that fabric visiting my sister, and that was on sale…” every time I glance in that direction. It is not condusive to focusing on what I’m working on, be it crafts or anything else. I’m not against pictures on the walls, but I find our new, nearly bare walls are much more calming than the accumulation of stuff on every wall at our old place. Now I know it’s better to leave a wall or two bare. I like the way you think too Jane. Clockwise thinking! I like this! What I find interesting is what was in the “too hard” pile at an earlier stage of my decluttering, slowly morphs into being easy to make a decision on at a later stage. As I re-visit areas I get bored (?) of seeing those items over and over again and each time, (items that I would have been adamant at one stage would NOT be thrown out) these items one by one become easy to hiff. So when something is ‘too hard’ to deal with right now, or I don’t have the answer for re-housing it right now, more often than not, a post pops up not long after which gives the right nudge. Moni, I never thought of it that way – but you are so very spot on when you say an item becomes boring when you revisit it again & again until it becomes the chosen item to get decluttered. I can’t tell you how many times I’ve been 100% firm in my decision NOT to declutter a certain item only to gleefully declutter that very same item a few months later. I think deep down inside there exists the truth & my UNconscious mind knows that truth exists so when my conscious mind declares an item off limits to decluttering & then I later declutter said item – it never comes as a big surprise to me. It feels like an inevitable thing to do. I had a moose cookie jar that I swore to any & all who would hear me that I would never ever get rid of it. Never! Ever! Never mind I kept it in a box in the back of the attic since it came to my home. Never mind I only displayed it once & never mind I never actually put cookies in the moose cookie jar & never mind that it always looked out of place despite it being so stinking cute. I took it to the donation store a week ago. Do I miss it? Not in the least. “Declutter muscle”…that is brilliant, Colleen. I just read a cartoon about “Ariel” from Disney’s The Little Mermaid being on an episode of Hoarders, haha! Just a quick comment about using less. I adopted using 1/2 of the manufacturers recommended amount for everything (dishwashing detergent, laundry detergent, shampoo etc.) I have been doing that for decades and I’ve lived to tell the tale. Hi Kimberly, I have seen similar cartoons about Ariel being a horder. You might find this interesting. This was such a good post! I think that the “muscle” comes from how you feel after an area — whether it be a drawer, a closet, a room, or whatever is decluttered. I know that I feel “empowered” after I declutter. I feel that I have now am in charge — I have power over the stuff and that it does not have power over me any longer. Even decluttering e-mail gives me a “declutterer’s high.” It makes me feel light and free and calm.